Yesterday, I went at about half speed. I uploaded a bunch of stuff to my Etsy shop, unloaded all the paintings from my car, took some reference photos, and broke my desk lamp while using it as a base for my gorilla tripod. All in a day's work. I ate some turkey noodle soup for dinner while watching Cake Masters, but before that, I did this page of random doodles. 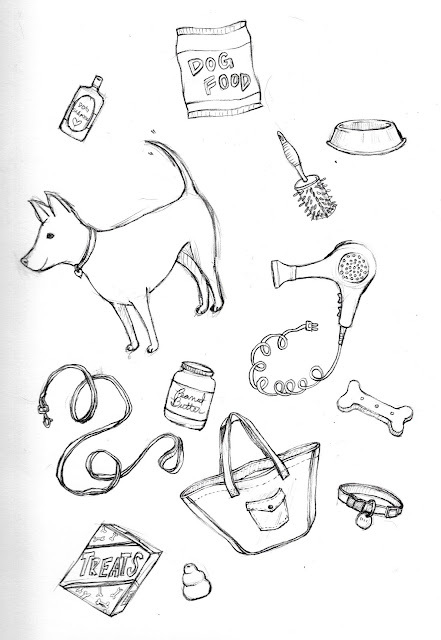 I'm not really sure why I added the hair dryer and round brush, but there you have it. That thing at the bottom is a Kong toy. If you have a dog, you know all about this. Well, that's it. Have a happy Tuesday! I have to get back to full speed working today. Enjoy!